An expert on developing an economy in the US is helping to come up with ideas for how the north of Scotland copes with the closure of Dounreay. 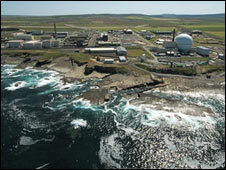 The nuclear research complex in Caithness is being decommissioned. Dr Gerald Gordon, president of the Fairfax County Economic Development Authority in Virginia, is working with North Highland College in Thurso. He has been tasked with making recommendations on what companies could be attracted to the north Highlands. Fairfax County outside Washington DC has more than 5,400 technology companies, including more than 60 from the UK. Dr Gordon was granted a Fulbright Award to come up with a series of recommendations on how to maintain and develop skilled employment in the far north. The US-UK awards scheme was set up in 1948 to raise mutual understanding between the US and the UK. Dr Gordon said: "There is a reservoir of engineering and technical skills across a multitude of fields in this region and it is vital that they are retained as a business asset of the North Highlands." Lord Maclennan, chairman of the North Highland Initiative, which was founded by Prince Charles to work on ways to develop the area's economy, welcomed the US expert's input. He said: "His work at the North Highland College, in Thurso, will contribute in practical ways to achieving our vision for sustainable growth - a crucial objective in itself but more so in the light of Dounreay's decommissioning."